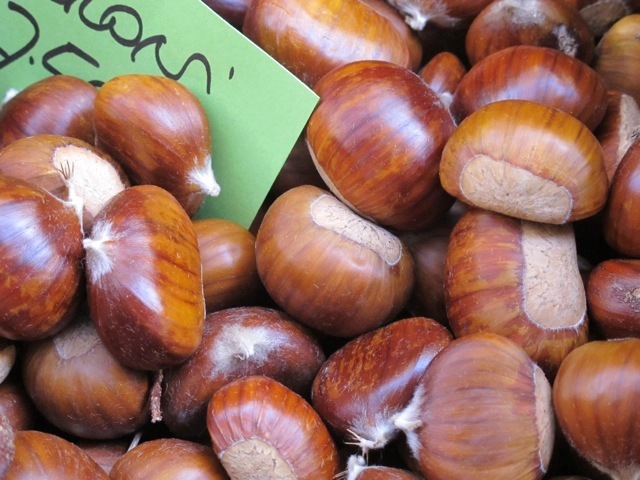 The annual Chestnut Festival…..Festa della Castagna, will be held this Sunday 7th October in the park beside Villa Fiori at Ponte a Serraglio. The local Alpini group will be providing roasted chestnuts and delicious necci. Last year I recall they served some excellent pasta fritta as well. There will be several stands selling arts and crafts and there will be painting and drawing for children, provided by the Borgo degli Artisti. Festivities will begin at 10.00am. Don’t miss what is sure to be a fun day. This entry was posted in Things to see and do and tagged Bagni di Lucca, Chestnut festival, Italy, local events, photography, travel, Tuscany by Debra Kolkka. Bookmark the permalink. thank you, Debra..and painting is not only for children…adults can join in as well painting real pumpkins and monsters! see you on Sunday! Let’s hope we have a fine sunny day on Sunday. It was fun last year and I’m sure it will be again. Sounds a beautiful day Debra. The smell of chestnuts wafting would be enough to persuade me….No doubt you’ll ‘cover’ the proceedings for us!!! I will certainly be there to eat chestnuts and take photos. There is nothing nicer than roasted chestnuts…I use chestnut paste in puddings and even on bread like peanut butter…a lot sweeter but yummy!! I love chestnut paste as well….and I use a chestnut spread to make the delicious cake from a very early Women’s Weekly recipe book….possibly 30 years old or more. Sounds lovely. But what are necci? Necci are pancakes made from chestnut flour. They are often filled with ricotta, or these days, nutella. I would give anything for a couple of necci right now. Filled with ricotta, sausage or rapini, there is nothing better. Necci are what kept many from starving during the war and were really out of favor until recently. I was amazed when I discovered that Italians from other parts of Italy never heard of them. Again, thank you for a great post and for permitting me to enjoy a bit of BDL from here. I would love to be there in the Fall and plan on making it happen. Necci are an acquired taste and they must be freshly made and still warm…..which of course they will be on Sunday. Why don’t you come on over? Sounds like it will be lots of fun with some good things to eat. I enjoyed the chestnuts, necci and pasta fritta last year, so I am looking forward to Sunday. I wish I was joining you. We are heading to Europe again but Italy is not on our itinerary this year….perhaps the next. Italy is here waiting for you. yaaaaaay, more food-fotos to anticipate! I will take some just for you. I do hope that they will be selling the new chestnut flour so that I will be able to prepare “castagnaccio”. In any case, I will see you there. Surely there will be some chestnut flour for you. My mother loved chesnuts! … thanks for the reminder. While in La Villa, call into the information office (open in the mornings, not Sunday) in case there is a performance at the local theatre, or an exhibition at the Circolo dei Forrestieri. It is amazing how much happens in this tiny place.